One of my favorite places in Istanbul is the Byzantine Church of the Holy Savior in Chora, also known as the Kariye Camii or the Chora Museum. The surviving structure is mostly from the 11th century, but when the original church was built on this site in the 4th century, it was outside the city walls. Chora means country in ancient Greek. It’s a relatively small church and although pleasant enough, there’s nothing outstanding about the architecture. The real reason to visit is to see the 14th-century mosaics and frescos that cover the interior walls. After the Ottoman conquest, the church was converted to a mosque and the figurative art, not allowed in Islam, was covered in plaster. Restoration of the mosaics and frescos began in the 1940s, and today the walls, domes and vaults are wrapped in nearly 50 vivid biblical scenes. It’s wonderful to behold and slightly eerie, the kind of place where you only speak in hushed tones, just because. 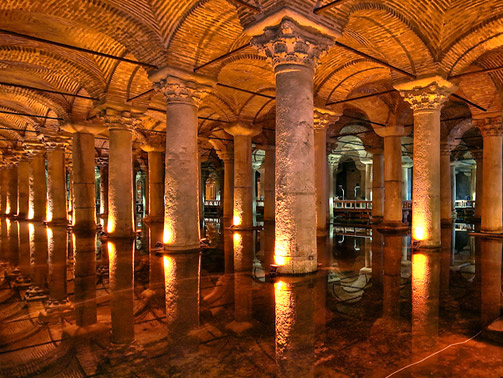 Another deliciously spooky place that compels quiet voices is the subterranean Basilica Cistern. Just across the street from the Hagia Sophia, it was built in the 6th century to store water for the palace and other nearby buildings. Raised walkways allow visitors to walk among the 336 marble columns without getting their feet wet or stepping on the resident fish. The columns and vaulted ceiling are reflected in the standing water and light and shadow play off the surfaces for an otherworldly effect. With a bit more time, there are plenty of trendy neighborhoods right off the tourist track where locals stroll the cobbled streets, browse boutique shops and observe the scene from cafes. One such neighborhood is Galata at the northern foot of the Galata Bridge, which crosses the Golden Horn, an arm of water reaching off the Bosphorus and separating European Istanbul (as opposed to Asian Istanbul, across the Bosphorus) into old and new. Follow this blog for a chance to win a $10 Starbucks gift card. Starting August 21st, each Wednesday, we’ll draw a name from new followers. This entry was posted in Istanbul, Turkey and tagged Basilica Cistern, Bosphorus, Galata Bridge, Golden Horn, Hagia Sophia, Islam, Istanbul, Ottoman Empire by yalla2013. Bookmark the permalink. Very well-written text! A “keeper” for sure!